Our rung profiles can fortunately prevent slipping. They are non-slip whether they encounter water, oil or other smooth materials. They stay safe. 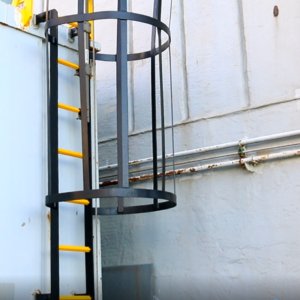 Ladder rung profiles from Real Safety prevent slips and falls and can be mounted directly on the existing rungs - regardless of material or shape. All of our ladder rung profiles are made of quality fibreglass with embedded silicon carbide stones that make the steps almost indestructible and very slip-resistant. Unfortunately, too many accidents occur when using ladders, and there is an increased danger associated with such a fall as this potentially can be several meters. Naturally, we advise everyone to get their ladder rungs slip-proofed. However, we especially advise people who use outdoor ladders to slip-proof their steps and ladders, as the rung of the ladders become slippery by the sligtest moisture or rain. Similarily, ladder rungs in the food industry are very risky areas because grease, oil and other organic material are known safety liabilities here. Our ladder rung profiles will prevent slipping. They are non-slip, no matter if they are wet, oily or greasy. They remain anti-slip and safe. We provide both half round, channel and diamond shaped rung profiles. Each profile can easily be mounted directly on the existing rung without. We produce ladder rung profiles in many different colors. Some colors are expressive and very visual, reminding us that ladders are places where accidents may occur. Although our step profiles may vary in appearance, we guarantee that the materials are always of the same high quality. Our step profiles are made of high quality fibreglass with embedded silicon carbide stones that guarantees a safe and durable non-slip surface. We know the many different ladder types that exist and therefore we are aware that a diverse and versatile range is necessary within ladder rung safety solutions. That is why we strive to have products for all ladder types, and untill now we have solved every assignment of slippery ladders to our customers satifaction. And we look forward for your challenge. Ladders are extremely important to secure. Many ladders are quite slippery, especially if the rungs are in contact with water, grease or other slippery organic materials. Fall injuries from ladders have an extra danger potential depending on the height where the shoe looses the grip. A fall from several meters may be fatal. Therefore it is extremely important to slip-proof all ladders in order to significantly eliminate the risk of a serious slip accident. Luckily, the solution is quick and easy is guaranteed to last for at least 10 years or more. Do you have questions regarding anti-slip protection? 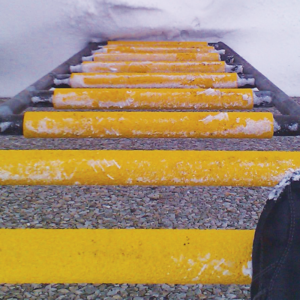 The entire team of Real Safety has a broad knowledge of slip resistance for all kinds of surfaces, including ladders. Therefore we will be able to answer all questions you may have within safety solutions. If you have a question or a safety challenge, please feel free to contact us by phone or mail. 1. Clean & glue. - 2. Place. - 3. Press. 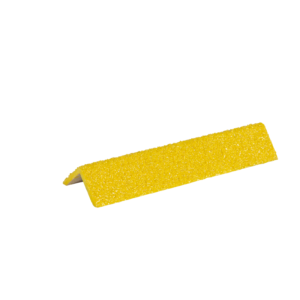 Read about our recommended industrial cleaner and glue under Mounting Kits and Accessories. Download product data sheets from the DATA tab. Do you know them already? Purchase yours from our shop.